Time for some crispy fries with hot gravy and squeaky cheese! The first time we tried this Canadian & Midwestern specialty, my husband and I were in Wisconsin (the land of cheese and beer). 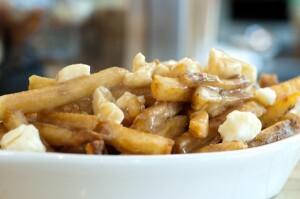 After a brewsky or two, on came the poutine! I was hesitant to try until I saw this dish in person, smelled it for myself, and saw the melty cheese…I was immediately in love. Preheat the oven or fryer. Transfer crispy fries to an oven safe serving dish. Top with the gravy and cheese curds. Toss in the oven for 3-5 minutes.